This was just too perfect! So I injured my knee on the 18th and came home from California on the 23rd. So that means we are going into 13 days injured, 9 days at my house. 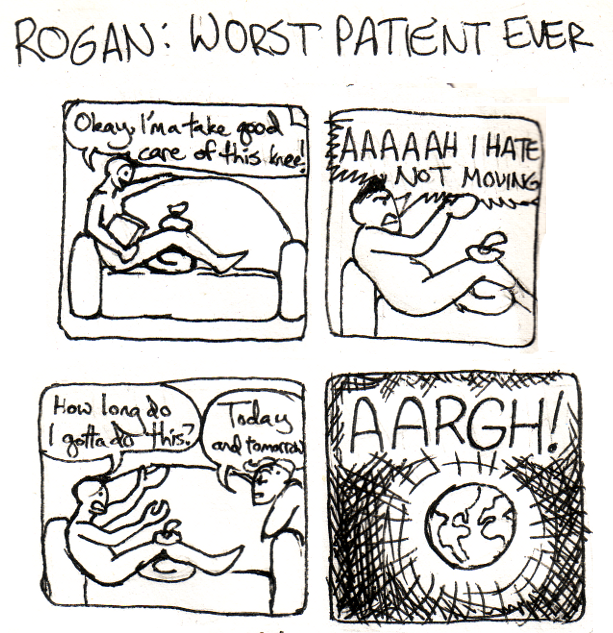 In that time I have basically adjusted to living upstairs like some kind of hermit, trying to move my leg just enough. I’m admittedly sick of microwave food but it is better than nothing. I have gotten to the point where I go downstairs once a day and then work there for a while and then come upstairs. It is tough going though and very painful . The doctor said it looks like it is a torn or strained MCL and we will know more next week after an MRI. It’s still very painful but improving each day too so I’m optimistic. What is interesting to me is with this strange life I’ve already developed a kind of routine. Wake up, nuke some breakfast, work, nuke some lunch (or a lunchable), and then head downstairs slowly, work down there, get a ride to the mail and bank and then eat dinner downstairs and slowly head upstairs. It actually has begun to feel kind of normal which is strange. It’s just amazing how the human body and brain can adapt to new situations so easily. But I need ideas friends of meals that require little to know cutting, chopping, dishes or anything else with standing. Preferably pre-made meals. What are the best in your opinion? 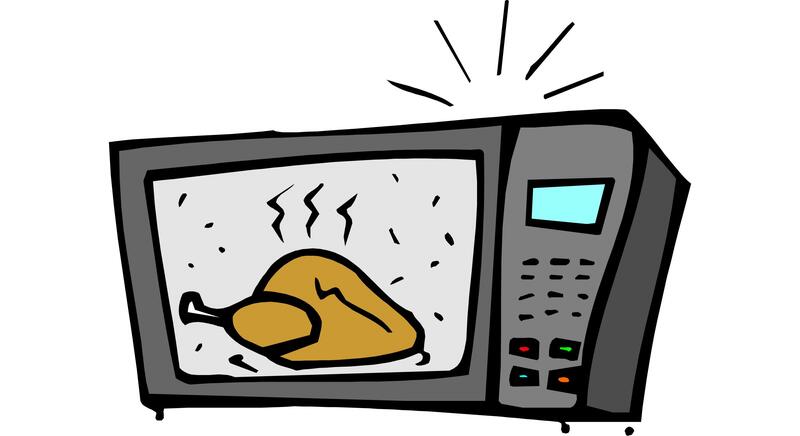 What would you do if you were stuck with only a microwave and fridge for half the day? I know some of you don’t comment much but I could really use feedback in this case, so thanks. I did get back to doing my videos today which I’m proud of. Take a look. I am getting kind of stir crazy because I feel fine, just in pain. If anyone wants to come over to visit or watch a movie with me that would be amazing. It’s interesting because I felt like my winning streak was going to die out. I had such a great June. On the other hand, it could have been much worse. Unless the MRI shows a complete tear I won’t have to get surgery which is a blessing. Plus I am so grateful to my work for being so flexible. Anyway, please send me your microwave/fridge ideas. Thanks! Ask me an easy one, next time! I’m dividing my chat into several messages, to avoid WordPress censorship. The only time I remember having frozen convenience food, was an occasional foil-tray meal, potpie, fish sticks or breaded shrimp, for a weekend kid’s lunch “treat.” Now and then, we’d have a stovetop box mac-and-cheese lunch, during the summer, if it was too hot to use the oven, and we didn’t have leftovers from another meal to finish up. That all sounds yummy. Normally I’d be all for the homemade food but dont have much choice with this knee. Wish I was rich and could hire a chef and an assistant! With my own bad knee and a broken sacroiliac joint, I’m with you, on that. Wow. It seems like you have experienced everything. What a crazy life! I dont mind the microwave on occasion but it is getting a little old. My mother cooked from scratch. She did use frozen ingredients (fruit, vegetables and fish), but not entrees. My father probably would have refused to eat them. He didn’t like 1-dish casseroles, either – he called them “messes” – except for deep-dish scratch chicken pie; chicken pieces baked atop a creamed rice-and-vegetable mixture; sliced beef or meatballs and gravy served over homemade noodles; or spaghetti sauce, made with meat that had to vary from week to week: hamburger, meatballs, chicken, Italian sausage, pigeon, little stuffed flank steak roll-ups tied with string; and served with different shapes of pasta. Ma had learned scratch cooking from her mother-in-law, because Ma’s mother mainly cooked out of cans, with a few ethnic main courses, soups and desserts for special occasions. That made it easy to fix lunch for Gramma when she lived with us; even as a middle school kid, I could flour a piece of defrosted codfish, or moosh together a Salisbury steak burger (hamburger, egg, oatmeal, minced onion and garlic), fry it, serve it with canned fruit and vegetables, and she was happy. A couple of times my lunch menu choices were visually uninspiring (fish, cauliflower and boiled potatoes; or hot dogs, beans and beets), but she didn’t complain. I cultivated a taste for canned food because of cooking for Gramma, and our family camping trips, so I keep that kind of stuff in my preparedness pantry: corned beef hash, spam, tuna fish, salmon, sardines, plain beef and chicken broth, canned vegs and fruit, tomato juice or V8. I even like canned orange juice. Years ago, I used to be able to get canned whole chickens, but I can’t find them anymore. I can’t use the small cans of beef or poultry, nor canned stews or soups, because they have modified food starch and/or wheat and barley (sources of gluten – ouch!). Otherwise, a fast meal for me would be a packet of cooked salad shrimp, or a couple of frozen tilapia filets nuked in a pie plate of lemon water, served with cocktail sauce, and canned or frozen fruit and veg (if I don’t have fresh fruit and salad ingredients). It’s amazing what chopped nuts, herbs, butter, or bacon bits can do for canned or frozen vegs, and canned fruit freshens up nicely with a sprinkle of lemon juice. I also like a dish I had in Spain: a small potato, nuked and chopped, sauteed with a bit of onion and then held together with scrambled eggs. Nowadays, my mother swears by a quick chicken soup of a couple of wings, sliced onion, carrot, celery and a Roma tomato thrown together in water after breakfast and left to simmer slowly until lunchtime, and for dessert, frozen berries mixed with plain vanilla yogurt. Hey, it’s lunchtime already! I’m hungry! My friend said she sticks ear of corn in husk 4 minutes in microwave and it’s great. Excited to try it!